Three decades ago today, heavyweight legend George Foreman was less than ten fights into his unlikely comeback; his return to the ring having taken place in March of 1987 after a ten-year layoff. Having bounced around a half-dozen or so decent enough fighters who were either uncharitably handed the description of “stiff” or were labelled even more disrespectfully, the 39 year old former champ was generally being laughed at as he rumbled on in his attempt to regain his former crown. In March of ’88, at Caesars Palace in Las Vegas, Foreman took a step up of sorts, as he agreed to face former light-heavyweight and cruiserweight champ Dwight Muhammad Qawi. What followed was a pretty bizarre, less than thrilling fight. Foreman, coming in at a quite svelte-looking 235 pounds, which would prove to be the lightest weight he would scale during his entire comeback, nevertheless looked slow (“almost fighting in slow-motion,” as commentators Al Bernstein and Gil Clancy – who once trained “Big George” – stated on air for ESPN) and oh so easy to hit. Qawi, standing a hair over 5’6,” came in at a hefty 222 (“a bouncing ball,” according to one of the most popular boxing magazines of the day) yet he managed to whack Foreman with a number of overhand rights to the noggin. This, the experts later wrote, made Foreman’s desire to get in there with current heavyweight king Mike Tyson as close to a suicide mission as could be imagined. Foreman, seemingly caring nothing for defence (according to Clancy, George’s sole punch of merit these days was the left jab) lumbered forward and eventually drained the out of shape Qawi of any remaining energy “The Camden Buzzsaw” had left. The early rounds belonged to Qawi, as he continually found the 6’4” giant’s chin – but it was to no avail. Foreman shook off the smaller, lighter man’s shots and just kept coming. Eventually, in round-seven, Qawi turned his back (“Qawi wants to quit,” said Clancy correctly) and pulled a “No Mas” (only this one would be neither as notable, as shocking, nor as mystifying as the quit job pulled by the fighter who this phrase was first, allegedly, uttered by eight years earlier). Foreman was now 8-0 in his comeback yet nowhere closer to being accepted as a genuine contender; or even as a genuine heavyweight fighter. It was just a joke, or a charade intended to make money, so the experts said of Foreman’s return from exile. And if one were basing Foreman’s chances of doing much of anything on this showing, who could have really thought any differently? It wasn’t as if Foreman was going to defy logic and somehow, miraculously, regain the world heavyweight title he last held in October of 1974, was it? Well, as we now know, but couldn’t possibly have known when he was being drilled by an overweight fighter who stood some ten-inches smaller than he, George WAS gearing up to shock, and delight, the entire world. 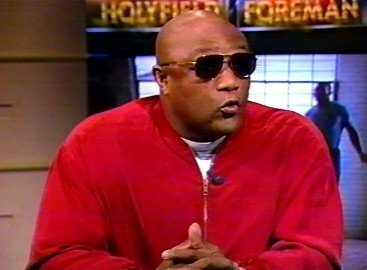 It would be almost seven years before Foreman managed to regain his crown, when he flattened another former light-heavyweight champ in Michael Moorer. And now nobody was laughing. Nobody at all. Who knows how different heavyweight boxing history might have been if Qawi had not quit in round-seven in Vegas 30 years ago today. If he’d been in shape, Qawi might even have had a real shot of winning a ten-round decision over Foreman. As for Qawi, he would later prove he was far from shot, as in 1989, at the age of almost 37, he came within a whisker of regaining the WBA cruiserweight title in a fight with Robert Daniels.